Haunted Houses in Winston Salem, North Carolina are some of the scariest haunted houses in America. Hauntworld.com tries to review only the best haunted houses in High Point, North Carolina. When you are looking for simply the best, scariest, haunted houses in North Carolina there is no other place to search than Hauntworld.com which offers our guests the best information to find North Carolina Haunted Houses including the best haunted attractions in High Point, North Carolina. There are many haunted houses in High Point that claim to the best haunted attraction but only one can truly lay claim to the being the scariest haunted house in North Carolina... Spookywoods Haunted Attraction in High Point, North Carolina. Welcome folks to Spookywoods, one of if not the largest outdoor haunted attraction in America. 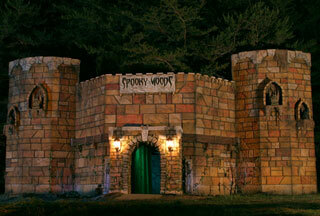 We’ll take an in depth look at Spookywoods located in High Point, NC with owners Donna and Tony Wohlgemuth. I met Tony actually through a bizarre phone call we had one day last year. One minute we hardly knew each other and the next minute we’re great friends! Tony talked to me for hours over the next few months asking me questions to help his haunted events, websites and more. What he didn’t realize was he thought he was plugging me for information, but in reality the more I talked to him the more I realized he was helping me. Tony and Donnas haunted event is massive, and they’re really pioneers in many ways as they’ve merged a typical farmer Halloween event with a really cool and spooky haunted event. The result is Spookywoods! Dates and Times Open: For Spookywoods it’s Thursday through Saturday from the last weekend in September to first weekend in November. Maize Adventure is open during the day Monday through Friday for groups of 100+ and on weekends for the public on Saturday and Sunday from 1pm to 6pm. Hauntworld Magazine: Tony and Donna please tell us how you got into the haunted attraction business. Give us all the details, what gave you the idea, where did you start, etc. Spookywoods: My parents emigrated from Switzerland in the 1967 and their dream was to purchase a farm. They were able to fill full that dream in 1979 when they purchased a 55 acre farm right off Exit 113 from I-85. I was only 9 years old when we moved onto this farm. It was a perfect place to grow up with a several tobacco barns, horse barn, pack house, corn crib and an old abandon farm house built in the early 1930’s. Our home was built close by making it only a short walk to work on the haunt. Not being farmers at all my father, being the entrepreneur he is, decided he wanted to grow Christmas Trees on a portion of the open pasture land. I helped plant over 1,000 pine seedlings in 1980 when I was 10 years old. Our farm was the place for all my friends to hang out with so many places to explore and have fun. The old farm house was untouched when we moved onto the farm until my parents remodeled it in 1982 to become a location for teaching classes for an off campus experience through the local community college. My mother taught European Knitting classes out of the old farm house for about a year. My friends and I used to camp out in the pack house which is located beside the farm house. We used to pull power from the farm house so we could have lights were we camped. On several occasions strange things would occur with the drop cord that we had pulled through a window from the farm house like it coming unplugged for no reason. It was also an issue on which one of us kids would go into the old house in the middle of the night to restore the power. On night it became a dare for the one that was brave enough to go upstairs alone. One night one of my friends took the dare and made his way up the creepy staircase, just as he made it to the top he screamed for help. This of course freaked us all out and another friend of mine ran up the stairs to see what was going on. Turns out a family of bats were living up stairs and one attached himself to the back of my friend that took the dare. This one terrifying experience gave us the idea to turn the old farm house into a haunted attraction. We called it the house of death and the five of my friends worked on it during the summer each year for something fun to do. We started out charging $2.00 per ticket for a guided trip through the 5 room house. As our attendance grew over the next 3 years and we were finishing high school the group of 5 boys split up some going to college out of town. One even started his own haunted house that only lasted 2 years. I decided to continue our haunt and run it myself. I knew I had to expand the show to offer more than just a small 5 room house. I found a local church youth group to run a haunted trail to go along with the house. This was short lived since I had no control over the staff. This same year I met Donna my wife in college. She thought I was nuts and should give up this childish mess and get on with my life. After she and I dated for the next three years she saw how much passion I had for the show and figured if you can’t beat’em why not join ‘em. With our combined efforts we decided to run the attraction like a business and a new venture was born. We attended a haunted attraction seminar in Atlanta in 1996 at IAAPA that changed everything. I then renamed the House of Death to Kersey Valley Spookywoods since wanted a friendlier name and the domain was available. We turned our 125 people per hour guided tour into over 600 people per unguided concept. I wanted to expand the show again and wondered if we could make a path through the Christmas Trees that we never cut since my father moved back to Switzerland in the late 80’s and we just let them grow. I took the next three months after IAAPA and cut every limb up to 12’ high out of the overgrown Christmas Tree Farm. I now had the most unique area to build a haunted maze in. Hauntworld Magazine: How did you come up with the name Spookywoods? How important do you think the name is to your business? The name Spookywoods seems to appeal to families and teenagers. Spookywoods: This name was picked since our main attraction is located in a pine forest and is family friendly and the domain name was available back in 1996 since most haunts did not even have a web site yet. The name of our haunt projects fun; I wanted to stay away from the idea of something bloody or terrorizing. I want my customers to have fun and I wanted to separate my show from the competition for being different. Hauntworld Magazine: How hard has it been to grow your business? How hard was it to make your event grow into what it has become? Spookywoods: I’m lucky in that for the first ten years I did not need my haunt to make money to continue to do it each year. I did it for the passion of scaring people on a low budget. We had a fan base that turned us into a tradition built on grass roots marketing. Once Donna got involved then it became serious and we invested in marketing and we had to run it like a business to make money. To start today from scratch would take a huge amount of money and risk to compete at the level we are at now. Hauntworld Magazine: Give us details about all the different attractions you have at night with the scary portion of Spookywoods. Spookywoods: Everything haunted is on one ticket. You start at the haunted house, that started it all back in 1985. Then you board a custom built tram that takes you through an area of large trees where characters can jump onboard with you. 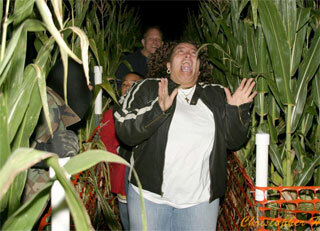 Then you exit the tram at the 2 acre haunted corn field. This is a one way path with actors and air scares hidden in the corn. We built a 35ft tall tower with an exploding fire ball as your only light source to guide you through the creepy corn field. Once out of the corn you make aproach the massive haunted castle façade. 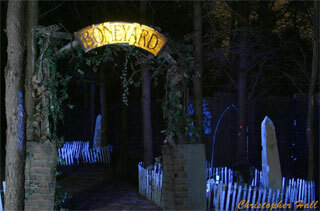 This is the entrance to Spookywoods, a walkthrough haunt maze inside the 90,000 square foot pine forest. Our main attraction and the focus of our imagination packed with unique sets and scares. Hauntworld Magazine: Tell us all the events you run during the day at Spookywoods. Spookywoods: We have the 10 acre Corn Maze, Gem & Fossil Dig, Rock Shop, Pumpkin Patch, Dinosaur Discovery, Snack Shack and Monster Shop. Hauntworld Magazine: Have you tried events that didn’t work out during the day or night? What are some of the lessons you learned the hard way? Spookywoods: We had a ropes course for corporate team building for 3 years. We learned that dealing with small groups is neither worth the effort nor the cost of insurance. We now focus on groups of 100 or more during the day to even open. Hauntworld Magazine: Do you market your daytime event separate from you nighttime event? Is it difficult to not confuse your patrons? Spookywoods: Yes we created a separate domain name to not confuse the customers for our daytime events. We are now becoming known for having both events; however at first it was hard to get across we are not scary during the day since Spookywoods is so well known. Hauntworld Magazine: One of the events you have is a tram ride, which is different than the traditional hayride. Why did you choose a tram ride and how has it helped your business? Spookywoods: I had a hayride using wagons for two years. Personally I feel that the hay wagon is not as scary or safe as our narrow trams. I like the trams for the fact we can have our actors jump on top and scare from above at anytime and being they are custom built we have an actor platform around the tram for easy attacks. Our trams are much more comfortable as well. Plus my competition started a hayride and I want to be unique. Hauntworld Magazine: You sell pumpkins at your event. From my understanding you didn’t do so well the first year but made a killing the next year. What are the does and don’ts of selling pumpkins and do you suggest more haunted events look into starting a pumpkin patch. Spookywoods: I thought like most that to have a pumpkin patch you have to grow them. The first year I grew pumpkins it was a pain to maintain them and I hated the look of the pumpkin patch having tall grass in it. The next year we built a pumpkin house and had a clean grass area for display. For me it works since I have thousands of families on the farm anyway and pumpkins are a natural fit. My advice to haunt owners would be to build a family daytime event that compliments the pumpkins. Once a kid picks a pumpkin 9 out to 10 times it’s going home with them! Hauntworld Magazine: You have a massive corn maze. Why don’t you open your corn maze at night for normal patrons? How do you design and build a corn maze and what kind of crowd does it appeal to? Spookywoods: We used to have our maze open at night during our Spookywoods operation. The reason we are no longer open at night is due to people like to cheat at night and damage the corn. The other reason is parking, a corn maze customer will be parked for 2 hours taking up a space which is limited to 540 cars. I would rather make $25.00 per patron for Spookywoods than $8.00 per person for a corn maze patron. Hauntworld Magazine: You’ve talked in the past about marketing your event to schools, churches, daycares, and more. How difficult is marketing to these groups and is it rewarding? Spookywoods: I have found that once you have a teacher sold or a youth leader by making it easy to do business with us they are a returning group with new faces each year. The hard parts of marketing our day time event was finding out exactly who are customers were. Hauntworld Magazine: In your market like most around the country when you become successful your competition tries to copy your success. Have you experienced this and what do you do to keep ahead of the curve? Spookywoods: We do see other attractions following our lead. When we do something we go for first class to create a professional event in all aspects. It is very clear in our presentation from our marketing materials to attention to details at the event that sets us apart from our competition. Our toughest competitor is ourselves, so we strive to top ourselves each year. We continue to reinvent ourselves and bring something new each year to improve the event and increase profits wherever possible. Hauntworld Magazine: Since a big part of your event appeals to families do you tone down scares at your nighttime event? How do you approach scaring patrons at Spookywoods given your family appeal? Spookywoods: We market to the family, but that does not mean we are not scary. We use very little if any blood or gross out scenes and focus on high startle scares immersed in high detail. I know John Burton is shaking his head right now, but for us it goes back to marketing. Our goal is to give a great scare and for the overall impression to be a WOW let’s do that again feeling. Our actors know when to hold back and we avoid the screaming kids. We deter children under the age of 10 from going through. 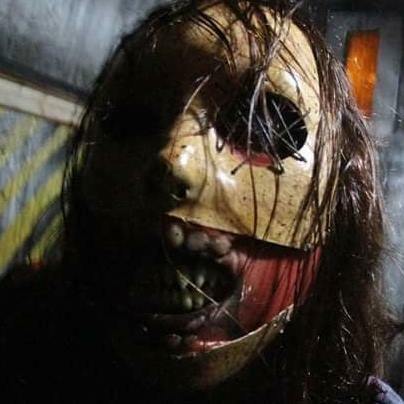 Hauntworld Magazine: Do you feel there is more appeal to a haunted attraction with a family appeal opposed to one with more blood and guts that targets teens? Spookywoods: This is all part of our master marketing plan, hook the family during the day at Maize Adventure and scare them at night. If I can impress guests during the day chances are they are going to come back to see our night time show. 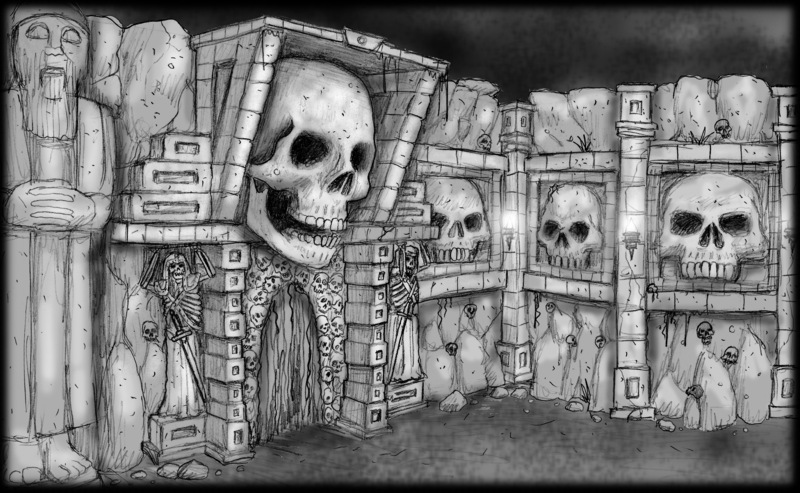 Hauntworld Magazine: What are some of the new events you’re adding to Spookywoods 2007? Spookywoods: Our Castle façade inspired by the Frozen Tundra Tour is massive and can be seen from our new bridge in the corn field maze. We have done a complete tear down of our Spookywoods maze and are building new sets inside. This goes back to staying ahead of the curve. If we create something new, at least you want see that at another haunted attraction until the following year. Hauntworld Magazine: How do you determine what you will do the following year at Spookywoods? What resources do you use if any? Spookywoods: My staff is made up of some amazing talents. Starting in January we have five meetings with my core group of ten. We ask for 5 scene ideas from each member. The following 4 meetings are narrowing down to top 20 scenes based on votes from the group. We have an artist sketch out each scene in detail with specs like music, props, and scare tactics. 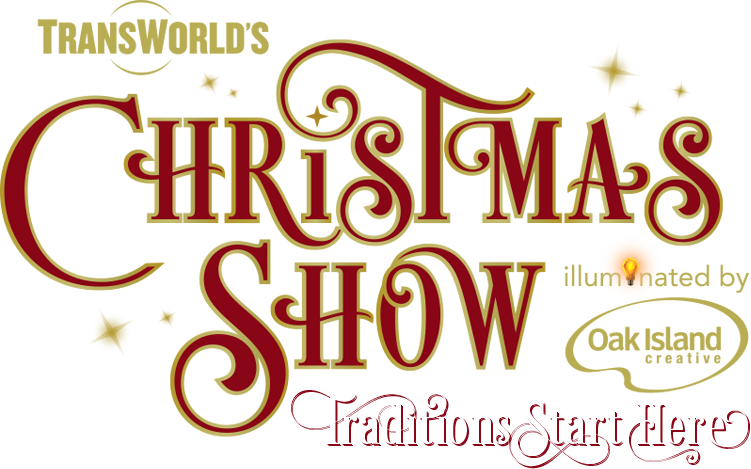 Then we attend the Transworld Halloween Show in February and look for props or ideas that fit our top 20. For example we found the springy bridge from Creative Visions to fit our Voodoo Bayou set perfectly and a vendor selling huge flowers that fit our Wicked Garden set. Going to Transworld with a plan like ours makes our job so much more fun and enjoyable. 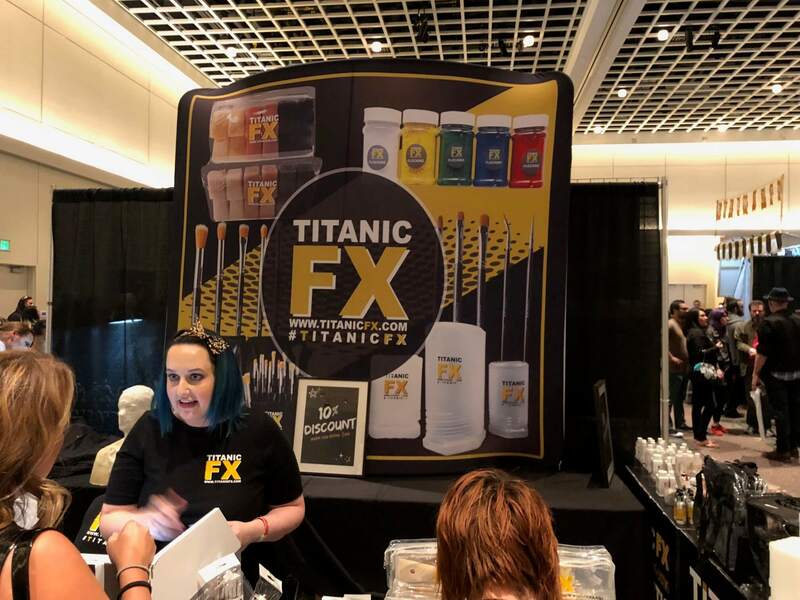 Hauntworld Magazine: You’ve explained to us you went to the IAAPA show and found a GEM DIG attraction, which has been a huge success for your business. Tell us about a GEM DIG and tell us what other idea’s you’ve discovered through the IAAPA show. Spookywoods: Well first of all Gem Dig was my renaming of Gem Mining. We wanted to start a new event and be unique so I registered the domain name first gemdig.com just to get my marketing safe. We were looking for something to expand our family attractions and Donna wanted to look into gem mining, since she is so passionate about genuine gem stones. We traveled to TN and visited every gem mining company we could find in Gatlinburg and Pigeon Forge. Over the course of a year we learned all we could about this event then we ran across a company from Canada that was at IAAPA selling Gem Mining setups. We hired them and they came to our farm in January and started construction on the largest mining attraction they ever built. We took their idea for a small setup and applied it to our large group policy for our daytime events. 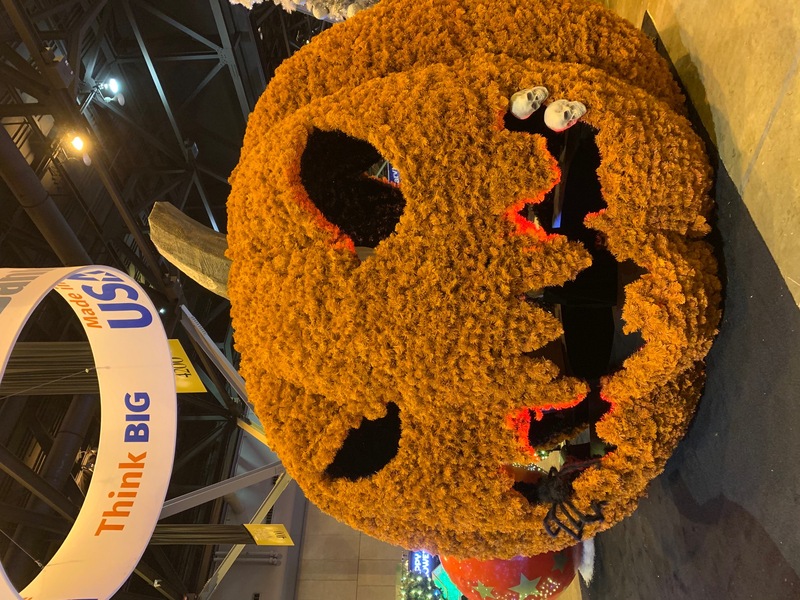 I have discovered that IAAPA is a great place to get inspiration for ideas and products we could use in our haunt as well. One such product is the Quick Spray Foam system we used on our Castle Façade to protect the foam. Hauntworld Magazine: How do you primarily market your event to your customers? I know you do a lot of unique marketing from telephone systems, and more. Spookywoods: We have been focusing our marketing on the internet and direct mail. We highly suggest advance tickets by phone or online for Spookywoods and reservations by phone for the Maize Adventure for large groups. This creates an opportunity to talk one on one with our customers and gives that personal touch they appreciate. Once we have them on the phone we can introduce the Spookywoods customers to the Maize and vice versa. Hauntworld Magazine: How has the internet changed your business? Where do you see the net going in terms of marketing you event? Hauntworld Magazine: Is Spookywoods a full time job for you two? How much work goes into producing this event annually? Spookywoods: Donna and I work full time on Spookywoods with a staff of 10 year round. To produce Spookywoods takes an amazing amount of dedication and creative talents in marketing and management of the staff coordinating roughly 130 employees when the show is in operation not including Maize Adventure that employees another 13. Hauntworld Magazine: Since your event is so massive how hard is it to manage your event on the busy nights? It must take a massive staff to produce Spookywoods. How do you manage such a large event? Spookywoods: The key to our success is team work and planning out every detail. To tell you the truth I work so hard during the year that when the doors open you can bet I will be playing our icon character in the haunted corn, the scarecrow. It takes a management staff with years of experience to run Spookywoods like clockwork. Our actors are managed in zones with each zone leader having communication with the other via two way radio. We have a dedicated person in charge of parking, tickets, tractors, trams, chain saws, security, and EMT services. We have 36 two way radios that keep everyone in touch, so you can imagine when someone talks it better be important. 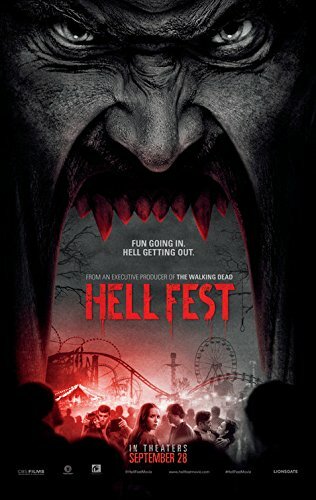 Hauntworld Magazine: How do you approach safety with such a large event? Spookywoods: Safety is first and foremost on the top of the list in everything we do. As it is very important to make friends in the media is it more important to build relationships with your local government agencies. In the beginning when I started Spookywoods my local county did not have a classification for Haunted Houses, they determined I fell under the guidelines of a Turkey Shoot. I worked closely with the building, fire and electrical departments and was able to get my county to make a new classification for haunted attractions. My fire Marshall is involved in the design process before we finish any construction. The head of my counties Fire Marshalls office became so interested in what we were doing that he now works on our staff. Either he or one of his employees are onsite every night. I provide tickets to the local fire stations and they teach a class on fire safety to my staff before we open for the season and get familiar with our event so when they are needed they have a plan of action. Hauntworld Magazine: Over the years what are some of your favorite scare tactics to frighten your customers? 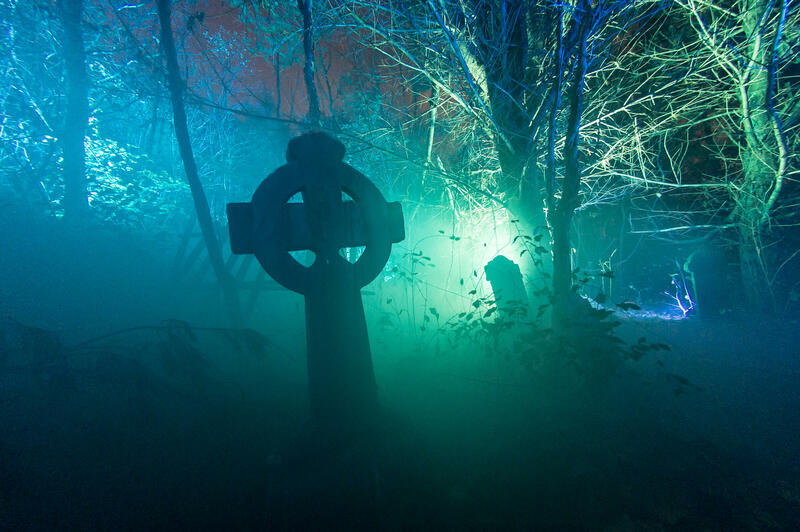 Spookywoods: Give so much detail to look at that they don’t see the scare coming. My favorite scare tactic is to setup a scene with lots of detail and a distraction scare. Then once this plays out the customer thinks that was the main scare and lets their guard down, that is the time to hit them hard with a in your face scare. This works the best for us since it is so unexpected. Hauntworld Magazine: Have you found people in the industry who have helped you take your event to the next level? What are some of the resources you’ve used to help you learn about our industry? What has inspired you? Spookywoods: Back in 1996 the seminar at IAAPA changed my life in that I was able to see the light that guided tours was limiting our success. 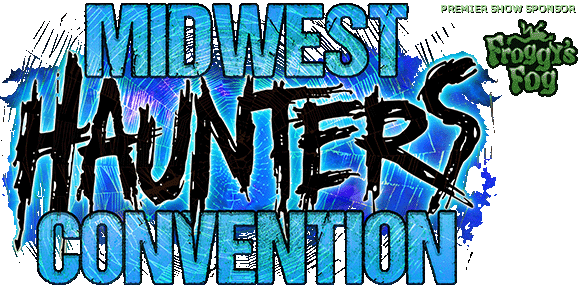 Building friendships with other haunt owners from around the world. Getting to know you Larry and tapping into all your knowledge has been priceless. We attended the Transworld Seminars for 3 years until that seemed to level out our learning curve. Haunt World Videos are a great insight into other attractions and the best teacher over all is experience. I have been inspired lately by the Frozen Tundra Tour that was the best tour I have ever been involved with. I was lucky enough to be a bus captain and make new friends on bus number 3 but also the Terror on the Fox inspired our Castle Façade. I think it is important to say I was inspired to do my own thing not copy what I had seen. The best haunt is the one that is unique in its own way. Hauntworld Magazine: If there was one thing our industry needs to do a better job of what is it in your opinion and what does Spookywoods need to improve on in the future? Spookywoods: As an industry we are still very small and divided, however the movement to organize with other owners not in your own market makes total sense to me. Sharing information and helping your fellow haunter outside your market can only benefit each other. Hauntworld Magazine: What will Spookywoods do doing five years from now? Do you plan that far into the future? What direction will our industry be headed; more family friendly, more gore, more animations, more what? 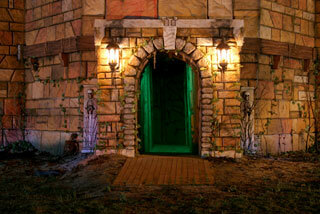 Spookywoods: When we build major sets like the Castle that is a five year set due to the major expense of it. We will continue to focus on families and the goal is to sell move more customers to advance tickets by phone and online across all the attractions. Spookywoods is just this year going 100% timed tickets with a strong push towards purchasing in advance. I see the corn maze following fast with this concept, simply due to more demand than product availability as we continue to grow our attendance. We will continue to stay away from gore and build more on the overall experience being personal with actors making a memory that lasts a lifetime. I plan to implement some larger animations just to take it to another level. However, real people scare far better than an animated monster. Hauntworld Magazine: What is the funniest story you can tell us about Spookywoods? Spookywoods: I have a cat prop that I use in the haunted corn field. This cat jumps out on a 10 foot pole from through the corn and pounces on people. One night a lady screamed and took off running after being pounced on. I noticed she came back a minute later but she could not see me hidden in a guile suite with the cat. So I pounced the cat on her a second time and she took off running again and screaming. She came back again and this time she was saying, “I lost my shoe can someone help me find it?” So started looking around my area and noticed I had a flip flop that was pulled back stage by the cat. I never said a word I just pushed it towards her with the cat and she grab it and took off. That’s my famous Cat on a Stick gag. Hauntworld Magazine: If another haunter wanted to start their own pumpkin patch, corn maze or daytime events, what suggestions would you offer? Where should they learn or what information do they need? Spookywoods: My suggestion would be to locate it as far away from NC as possible. LOL. Honestly, before you jump into another attraction first do as much research as you can and learn from others that have gone down that road. 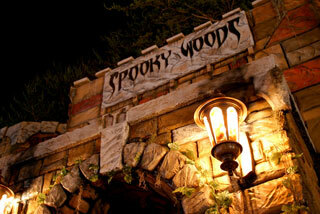 Hauntworld Magazine: What do your customers love about Spookywoods and what is their favorite part of the attraction? Also tell us what your favorite scare at Spookywoods is. Spookywoods: I ask my customers that same question on my website. I have over ten years of comments on my reviews page. I feel that making the overall experience worth more than the ticket price is the key to success. Keep reinventing ourselves to keep the attraction fresh and unique is important. Being honest and not over delivering our marketing with hype is crucial. I truly can say the majority of the comments say the loved everything. My personal favorite last season was our custom built Hellevator in the haunted house. This one scene took months to complete and is truly unique in the industry. People only get ripped off once, so repeat business and word of mouth will prevail. Hauntworld Magazine: There has been recent debate about how to compensate workers in a haunted attraction, how to do handle this? Spookywoods: We consulted our attorney on this very question some years ago just to get it straight from the law books. We pay everyone by the hour once a month and carry all the required insurance. This goes back to being a business now; we no longer can afford to pay with pizza like we did when we started in 1985. This is our lively hood and it is worth far more than saving some on payroll.